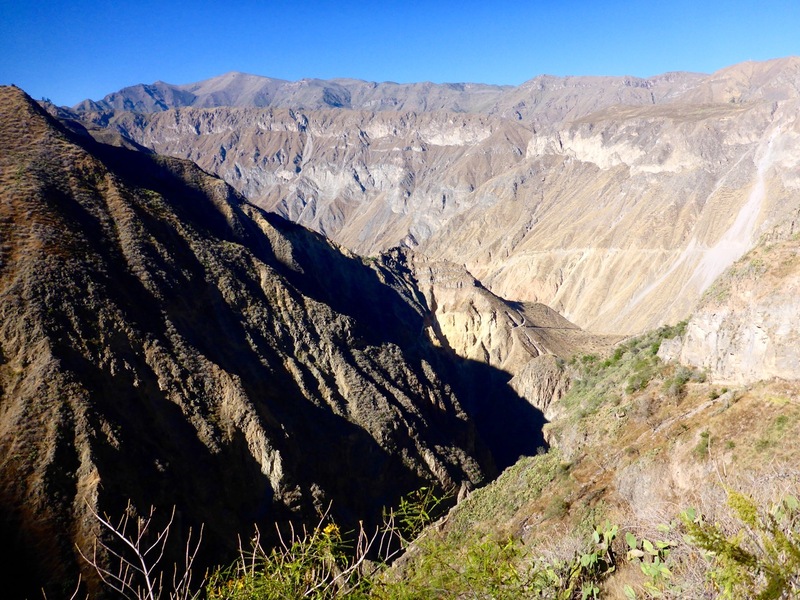 Peru is home to the world’s deepest and second deepest canyons, both are just outside of Arequipa. 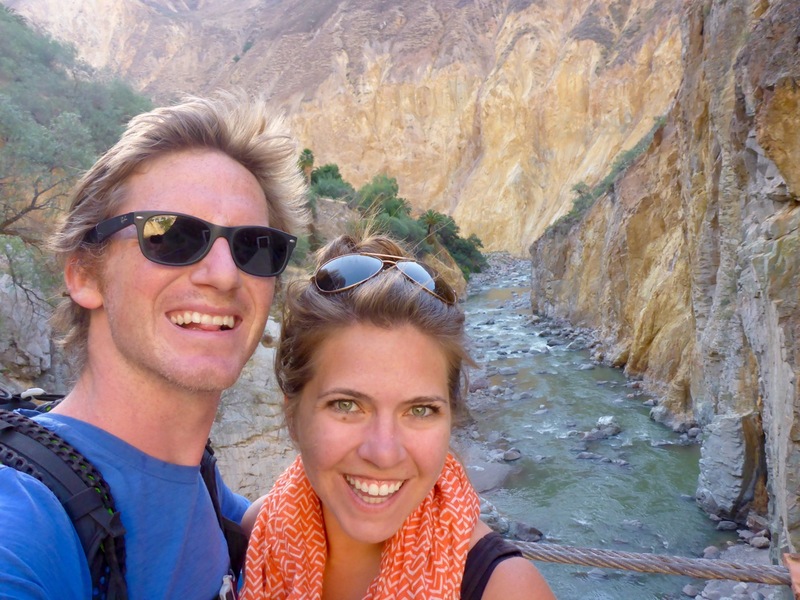 We wanted to hike at least one of them, and being of the anti-guided mindset, found Colca Canyon to be more independent traveler friendly with a nice little circuit of small villages about a days hike apart throughout the canyon. 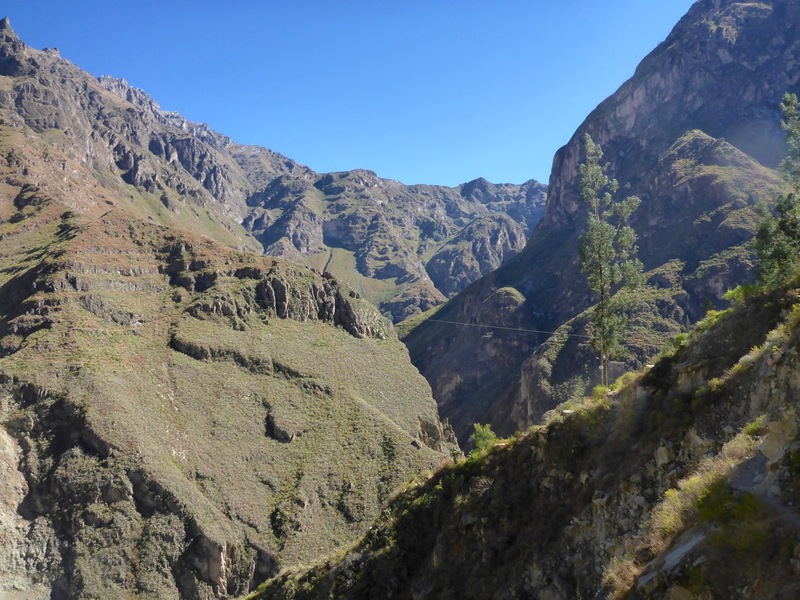 We had heard that the main route from the “larger” town at the canyon rim, Cabanaconde, to the oasis village at the bottom, Sangelle, was pretty packed with tour groups. So we decided to take an alternative route to get off the beaten path. Unfortunately, to get to the canyon rim we had to take a tourist bus. It picked us up at 3:00am and we fortunately were able to sleep for the first couple of hours. But within fifteen minutes of being awake and listening to the guide we were so glad we would be departing from him shortly. 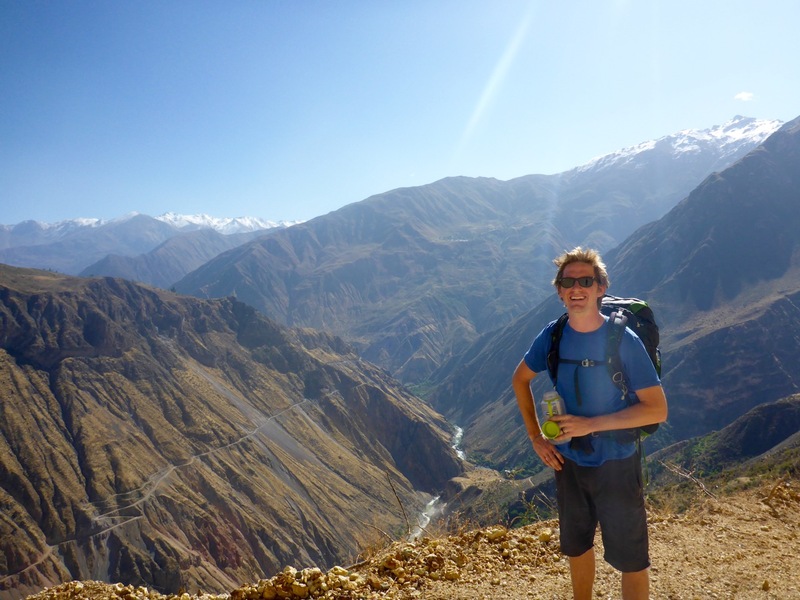 Once we arrived in Cabanaconde we stopped at Pachamama Hostel to grab a trail map and advice on the alternative trekking options. They were really helpful and we confidently set off on our way. We only made it to the edge of town before we got completely distracted by a horse auction going on in an old bull fighting ring. We each picked out which horse we would buy, if we were going to buy a horse in Peru. I chose a big (for a Peruvian horse) bay stallion with a “c” mark on his forehead. Rick picked one of the younger black horses. I struck up a conversation with one of the locals next to us and it was going smoothly until I asked how much a horse would cost… to which he responded “how many horses?”, I said just one, but that clearly was incomprehensible that I would want to buy just one horse. Apparently in the Peruvian countryside you would NEVER buy just one horse, so we talked in circles for a few minutes, then he consulted the folks next to him about the crazy idea of buying just one horse and how much it would cost. The answer was 400 Soles, about $125 US dollars. What a deal! But horses are difficult to cross borders with so we forced ourselves to leave the auction and start the hike. The first day was mostly downhill into the canyon. We saw lots of cactus and birds, and the condors were the star of the show that day. We saw over a dozen of them soaring over our heads. We were told it was a five hour hike, but we made it in a little under three hours and arrived at Llahaur. 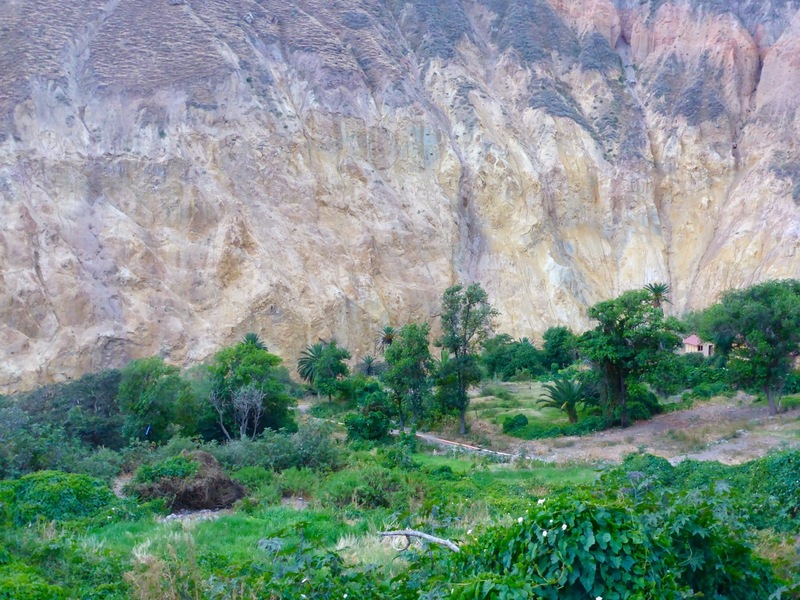 Llahaur can’t even be considered a village… it’s really just a spot on the river where a family has erected some bamboo huts and a little restaurant because there are hot springs there. It was adorable and the views were incredible. We set down our packs and went straight for the hot springs. We spent most of the afternoon and evening there enjoying the warm water and canyon views. It was, by our low standards, luxury trekking! We got to sleep in a bed, someone else made dinner and there were hot springs – score! We woke up refreshed and ready to tackle the uphill hike to the next village, Fure. 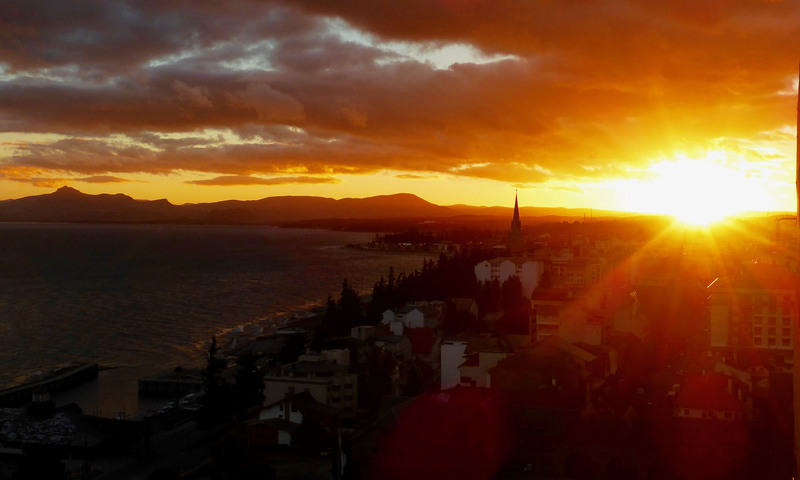 It was the one that would get us way off the beaten path. Fure is in a lush side canyon, off of the main canyon. We made great time getting up there, doing it in two hours instead of the five it was supposed to take. 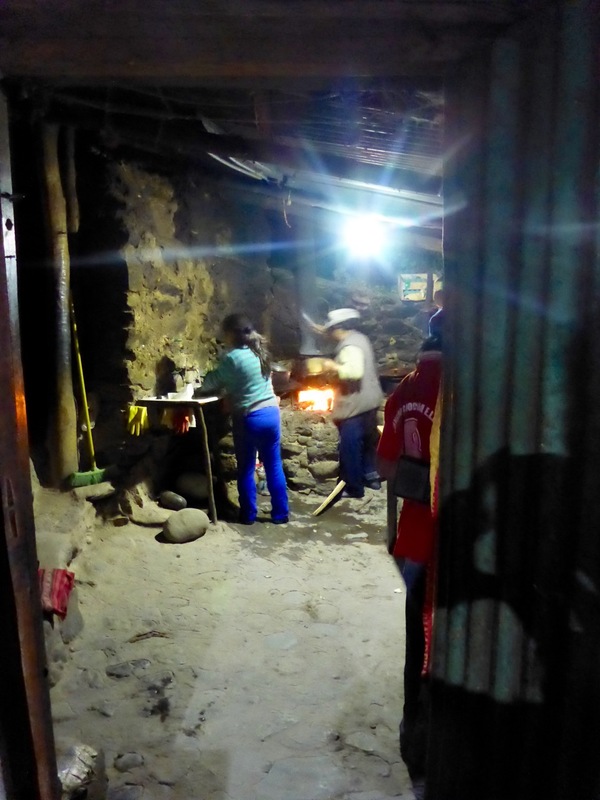 As soon as we arrived we realized this was probably not the place to stay – we had been told that locals would offer a room in their house to stay in, but the village (ten houses total) seemed to have been virtually abandoned. We met a woman who was walking her sheep up to graze and had a little house there. We wanted to make the out-and-back hike to the nearby waterfall, and she offered to watch our backpack while we hiked it. The waterfall was beautiful, all of the way back in the canyon. The water just came out of nowhere, from the middle of the rock, shooting out to a 110 foot drop. We planned to eat lunch at the house of the woman keeping our backpack, in exchange for keeping it. But when we asked her about lunch, she said she didn’t have anything to serve and we could go to the shop at the end of town. The shop was most definitely closed, like every other house there. It was supposed to be another solid day’s hike to get to Sangalle, but since we’d made great time in the morning we figured we could make it that afternoon. This section of the hike had some of the best scenery and views of the canyon and surrounding mountains. But the downside was that a large portion was on the dirt road – which always makes it feel like you’re hiking ten times longer than you actually are. Today’s hike also had the highlight of us getting the crap scared out of us, and running away from, the least intimidating animals ever. First it was the Attack Sheep of Death. Yes, a sheep scared us. It was perched on a terrace just above the trail and as we got closer, it started stomping it foot, making angry eyes at us and looking like it was going to either ram us, or more likely in my mind, taking a flying attack leap off its perch over us and batter us with ninja-like hoof moves. No kidding, we tried to talk it down but to no avail, this sheep did not want us there… so we covered our heads and ran past it! To add further insult to our day, this GIANT fly with a huge proboscis/stinger started following Rick and trying to bite him… which resulted in him flailing our Nalgene at it and then running away. (and I refused to come to his rescue). And the final moment of shame was when a quail surprised Rick on the trail, when he surprised it coming around a corner, and he screamed and hit the deck – I’m sure it was PTSD, Post Traumatic Sheep Disorder, that caused his dramatic reaction. Anyway, finally “The Oasis” of Sangalle came into view…. All we had left was a 3,000 foot descent into the valley! It wasn’t as knee-busting as we feared, but after putting in about 19 miles that day we were ready for some rest. Sangalle is called “The Oasis” because in the middle of this massive desert canyon, water literally flows from the rocks everywhere there. It’s filled with greenery, palm trees and pools! The pools are filled with constantly flowing natural water. It was really cool. We relaxed with a beer and big dinner and went to bed early. 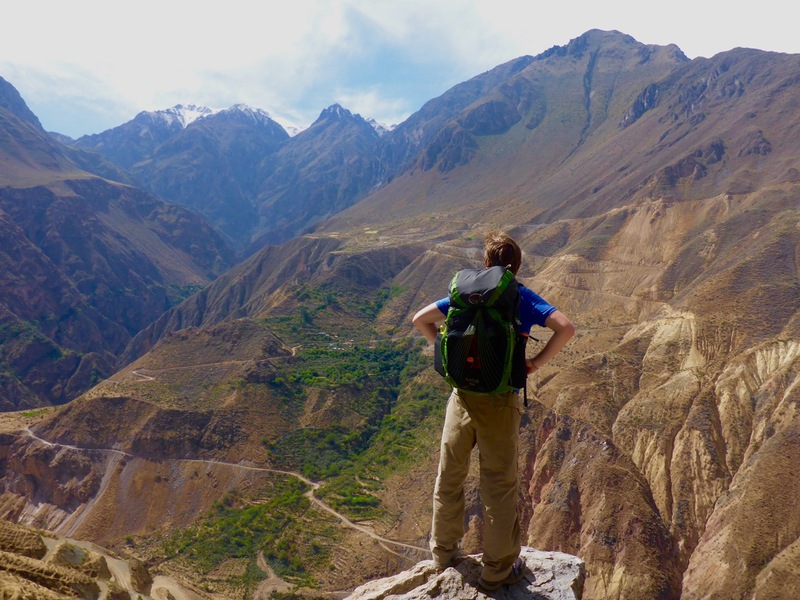 We had to wake up at 5:30am the next morning to make our way 3,900 feet up the side of the canyon back to Cabanaconde in time to catch a bus. We were thankful it was still chilly in the morning, because the ascent certainly warmed us up quickly. We made it in just under two hours, about half the time it was supposed to take us – Yea, we still got it! The canyon was really cool with lots of views and volcanic activity – from geysers to hot springs. The climb back up the canyon was nothing compared to the nine hour “sightseeing” bus ride back – ugh! We were dirty and exhausted when we got to Arequipa, but since there was no room for us in the hostel we decided to jump on a bus to Lima.